Karina's Kreations: Stampin'Up Happy Watercolor Sneak Peak! Stampin'Up Happy Watercolor Sneak Peak! What do you think of my sneak peak card? Isn't it beautiful? Actually my card had a different background but at my class yesterday Carrie added the dictionary stamp to her card and I liked it better! Here's the supply list from the new Occasions catalog that starts Jan 3rd. Email me at kchin2@telus.net if you want a catalog mailed to you! The card stock colors are Wild Wasabi, So Saffron & Water color Paper. 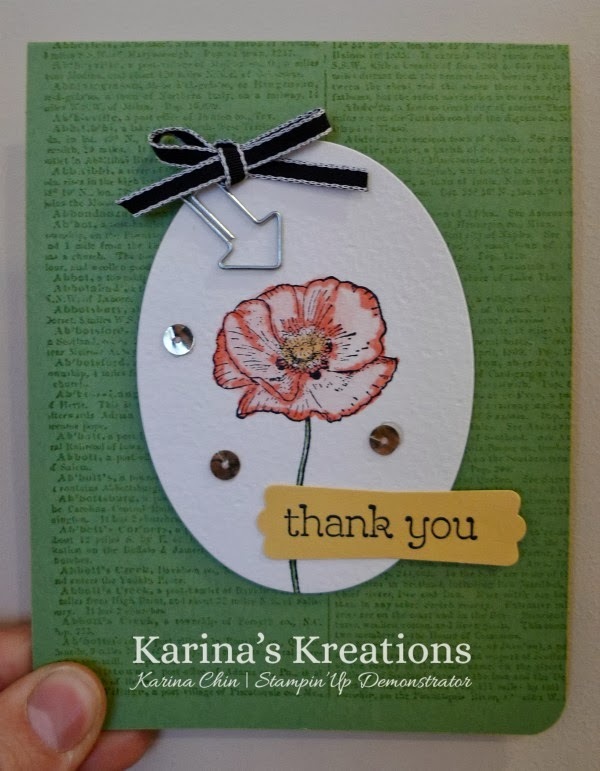 The flower was outlined with Calypso Coral So Saffron & Wild Wasabi Stampin Write markers and blended out with an aqua painter.